Cleavages along ethno-linguistic and territorial lines underlying party-political divisions are an enduring characteristic of Moldova’s elections, and were again starkly evident in the parliamentary campaign just concluded, on February 24 (see Part One, EDM, March 11). Within this overall configuration, however, the Moldovan/Romanian vote subdivides among several parties across the spectrum (right, center, left), whereas the “Russian-speaking” vote accrues practically in its entirety to the russophile Left. Vladimir Plahotniuc’s Democratic Party and the newly launched “NOW” Bloc, Moldova’s polar antagonists, competed over the Moldovan/Romanian vote in these elections. The Plahotniuc-NOW contest is limited to the arena of Moldova’s titular population. While the russophile-leftist Socialist Party did make substantial inroads into the Moldovan/Romanian electorate (specifically its “Moldovanist’’ portion), the Democratic Party and NOW made no inroads into the “Russian-speaking” electorate. That limitation cannot be surprising to NOW’s side, given its recent start and lack of campaign resources. 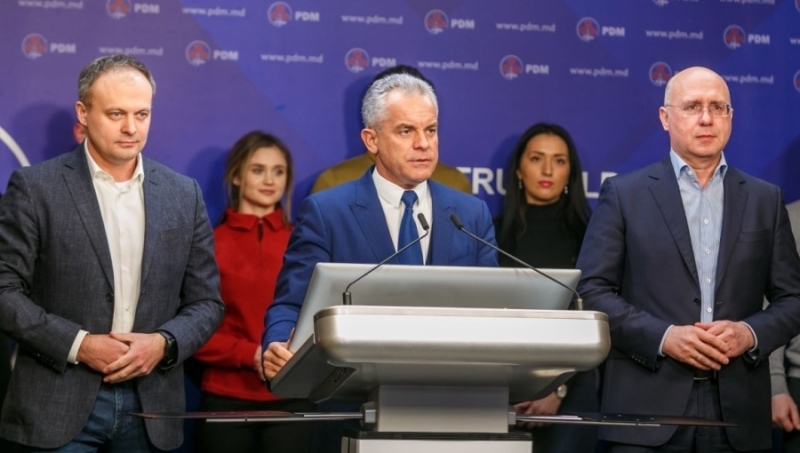 Plahotniuc’s party, however, with its patronage networks and control of the administration, did not undertake any serious effort to win over “Russian-speaking” voters in this campaign. Apparently, Plahotniuc’s party had decided from the outset to concede most of that electorate to President Igor Dodon’s Socialist Party. Even in its capacity as the party of power (indubitable in almost every way), Plahotniuc’s Democratic Party does not control the voting behavior of Moldova’s “Russian-speaking” population. This limitation presents a potential challenge to internal stability, but such risks are mitigated by Plahotniuc’s political cartel with Dodon. Conceding most of the “Russian-speaking” electorate to the Socialists is one major aspect of that cartel. Like all the other aspects, this too is conditional on Dodon guaranteeing that his party stays tame and does not materially challenge Plahotniuc’s overall power position. Without controlling the “Russian-speaking” vote country-wide, Moldova’s party of power cannot shape election outcomes in certain territorial enclaves where the non-Moldovan population predominates numerically. These are the Gagauz autonomous territory, the Bulgarian-populated Taraclia district, the russified city of Balti (right-bank Moldova’s second-largest city), and even one or two northernmost electoral districts in which russified Ukrainians hold (as those in Balti do) the balance of voting power. Those remain the Russophile Left’s fiefs after the parliamentary elections just held. Locally elected administrations there belong to the same camp, and will almost certainly be re-elected in June, when local elections are scheduled to be held country-wide. Any international experiment with a “special status” for the left-bank Transnistria would probably inspire a chain reaction of similar demands in those right-bank enclaves. This campaign was the least free, most unfair, and most overtly corrupt by the authorities (see Part One) in Moldova’s electoral history, as any seasoned observer of Moldovan elections could attest by comparing this with previous elections. The electoral legislation, adopted ahead of these elections in spite of the European Union’s and the Venice Commission’s objections, skewed the electoral system, mainly favoring Plahotniuc’s Democratic Party and to some degree Dodon’s Socialist Party. Jointly adopted by these two parties, this electoral legislation is yet another aspect of their political cartel (see above), in which Plahotniuc and Dodon are majority and minority stakeholders, respectively. The Organization for Security and Cooperation in Europe’s (OSCE) immediate post-election report, nevertheless, gave these elections a passing grade (OSCE press release, February 25), presumably out of concern that a fully candid assessment could delegitimize the newly elected parliament. The OSCE’s “day-after” report is, for each national election, a preliminary document, to be followed by a detailed final report and technical recommendations within two months of the elections. The incumbent Moldovan government will probably brush aside those post-factum recommendations, just as it did with the EU’s, the Venice Commission’s, and the OSCE’s own pre-election recommendations. Meanwhile, the preliminary report’s political effect is to instantly legitimize the newly-elected parliament. Transparency International and other local civic groups have taken issue with the OSCE’s preliminary report, without directly naming that organization. According to Transparency’s statements, the February 25 evaluation missed much of the context in which these elections took place, including state institutions supporting the ruling party’s electoral campaign, the recycling of financial fraud proceeds into the ruling party’s campaign funds and welfare projects, gerrymandering electoral districts in ways that distorted the elections’ outcome in favor of the same ruling party, and accepting the illegitimate participation of Transnistrian voters in Moldova’s elections (Transparency.md, February 26; RFE/RL, February 28). The European Parliament’s own election observation group merely “took note of” the OSCE’s preliminary assessment (rather than associating itself with it, as would have been routine). The European parliamentarians declined to issue an assessment for the time being, awaiting the OSCE’s final report as well as the Moldovan authorities’ handling of the post-election process. While the OSCE’s preliminary report deems the electoral process to have ended, the European Parliament’s observer group says that the process is not yet over and must be continually watched (Europarl.eu, March 5). Continuing the pattern set by the 2009, 2010 and 2014 parliamentary elections, the February 2019 vote produced a splintered parliament, necessitating complicated post-election negotiations to form a government or even new elections. The current post-election situation, however, differs from the preceding ones in two major ways. First, those above-mentioned parliaments contained slight majorities of mutually compatible parties that (at least) professed pro–European Union agendas; whereas this newly-elected parliament contains three mutually incompatible parties (Dodon’s Socialists, Plahotniuc’s Democrats, and the Bloc NOW, in the order of numerical strength). And second, Plahotniuc is now in a position to build a parliamentary majority coalition as he did in 2016 (the mid-term of the preceding parliament) by luring defectors from other parties, in the environment of a “kompromat state.” He may well combine the Shor Party (see Part One), several “independent” deputies and a dozen ad hoc allies from among the Socialist deputies, with Plahotniuc’s own Democratic Party, into a new parliamentary majority. External advice to the NOW Bloc to join a parliamentary majority with Plahotniuc has already proven flawed and will not be followed.